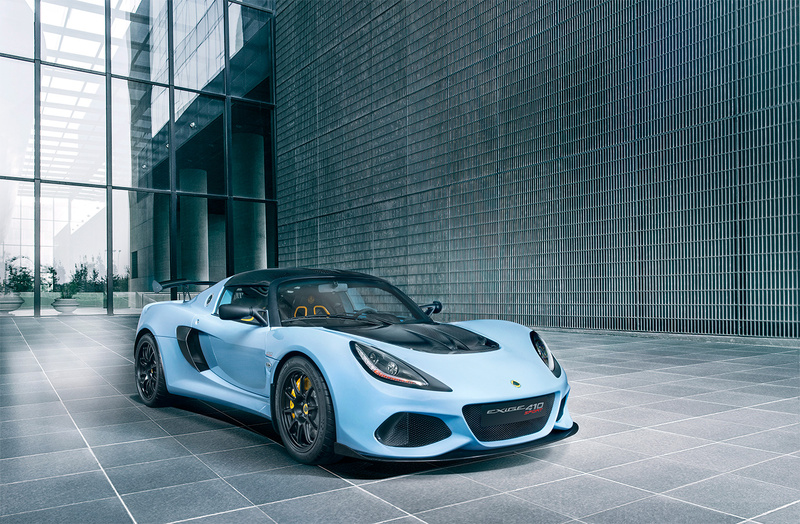 The new Lotus Exige Sport 410 is designed to be the ultimate road car and has been developed directly from the track-focused Exige Cup 430. Its 410 hp 3.5-litre supercharged and charge cooled V6 engine can launch the 1,054 kg car from 0-60 mph (0-96.5 km/h) in just 3.3 seconds. 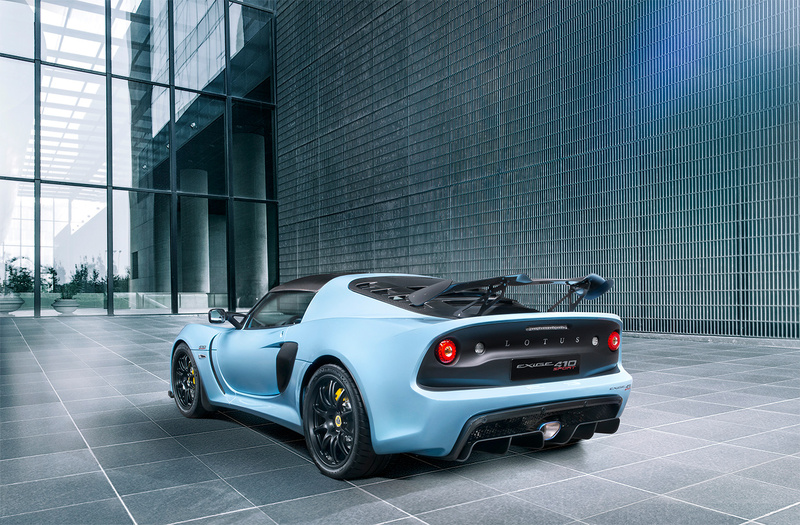 The Sport 410 is the lightest V6 Exige ever and is available as either a coupe or a roadster. Top speed is is 180 mph (290 km/h) in coupe configuration. The Sport 410 has been developed to generate 150 kg of downforce, 60 kg at the front and 90 kg at the rear. 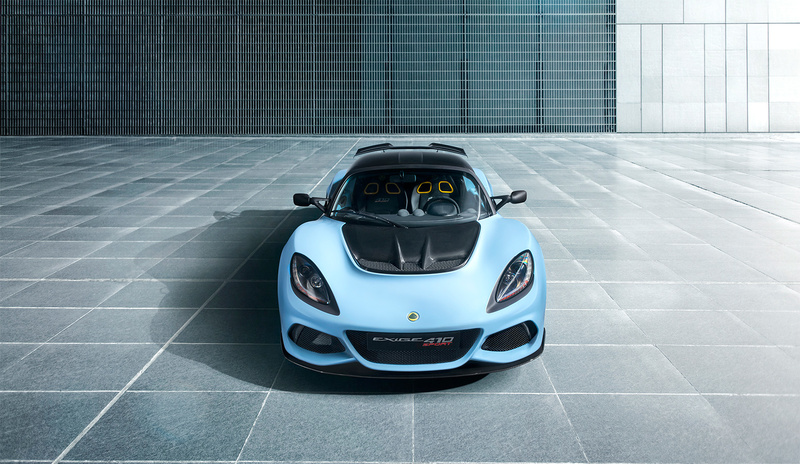 “With every new Lotus we look to move the bar higher and apply technology and development ideas drawn from top-of-the-range models,” said Jean-Marc Gales, CEO of Group Lotus. 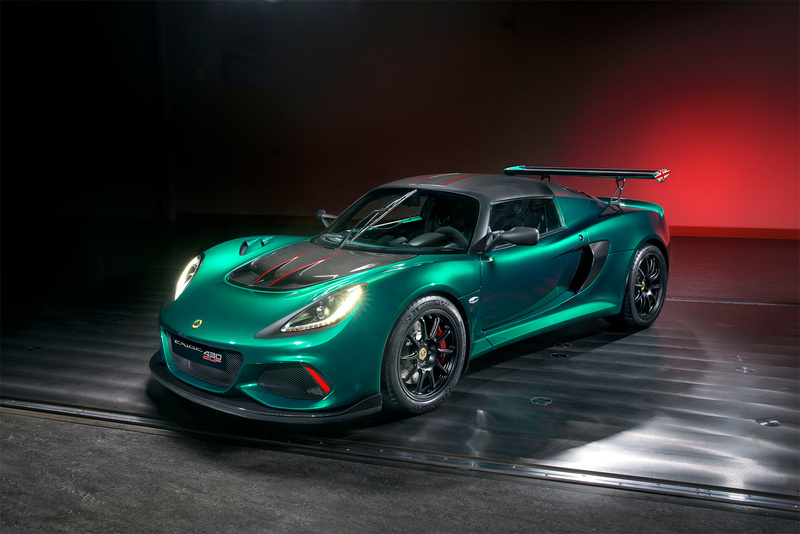 “Our agility as a company means that the lessons learnt today can quickly be incorporated into the cars of tomorrow and the Exige Sport 410 is a perfect example of this. We have taken the Exige Cup 430, the ultimate track-centric Exige, and developed it into the perfect road orientated sports car, ensuring that we stay ahead of rivals when it comes to cars that deliver a truly engaging analogue driving experience. 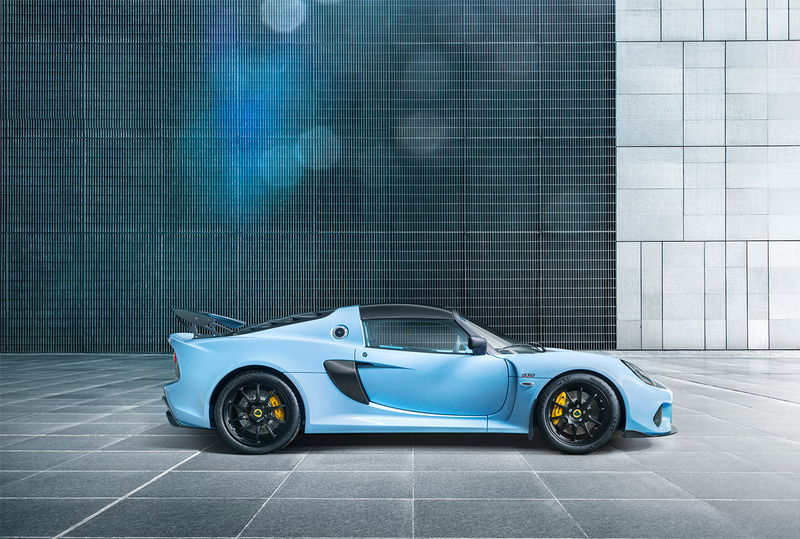 As with all Lotus cars, the Exige Sport 410 has outstanding handling and lightweight agility engineered into its DNA. Conveying high levels of tactility and precision, it’s developed to perform at its best with maximum enjoyment and driver feedback on the road. 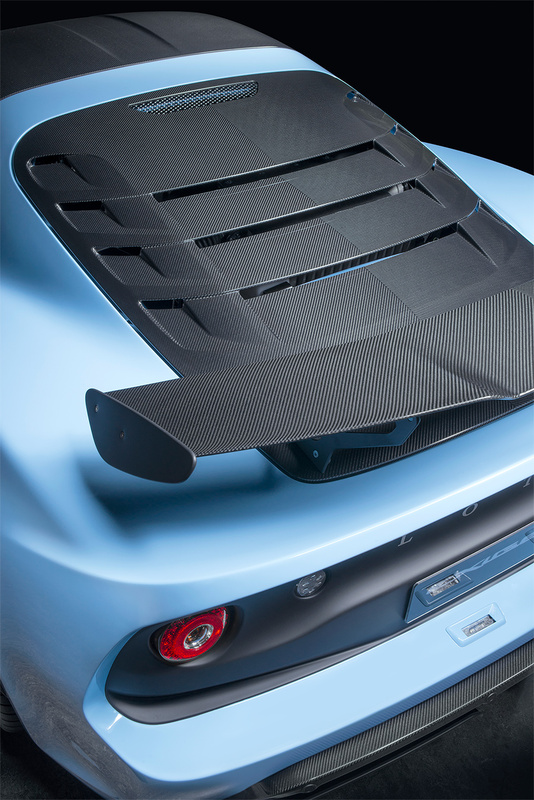 Working from Lotus’ standpoint as a leader in lightweight design, every gram has been justified, from the standard lightweight carbon front splitter and access panel at the front to the carbon side pods, tailgate and wing at the rear. 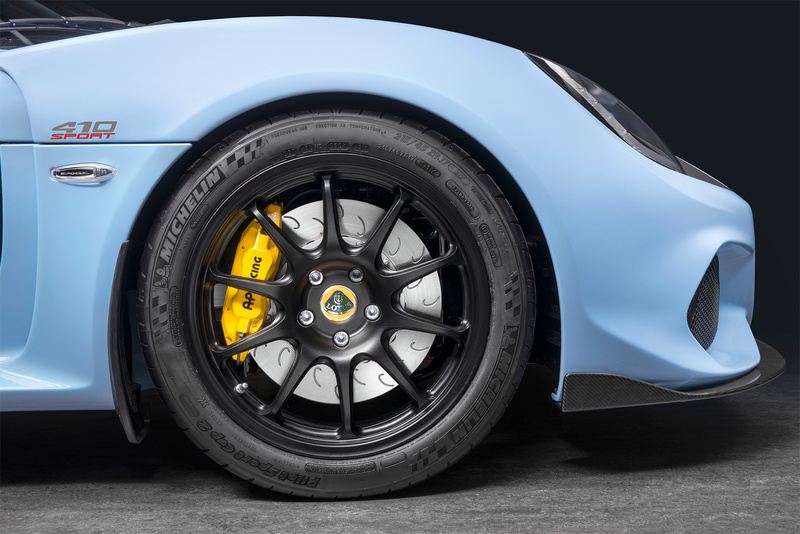 The Exige Sport 410 uses Michelin Pilot Sport Cup 2 tires with 285/30 ZR18 in the rear and 215/45 ZR17 up front. Braking is provided by AP Racing, with forged, four-piston calipers and performance two-piece J-hook brake discs. 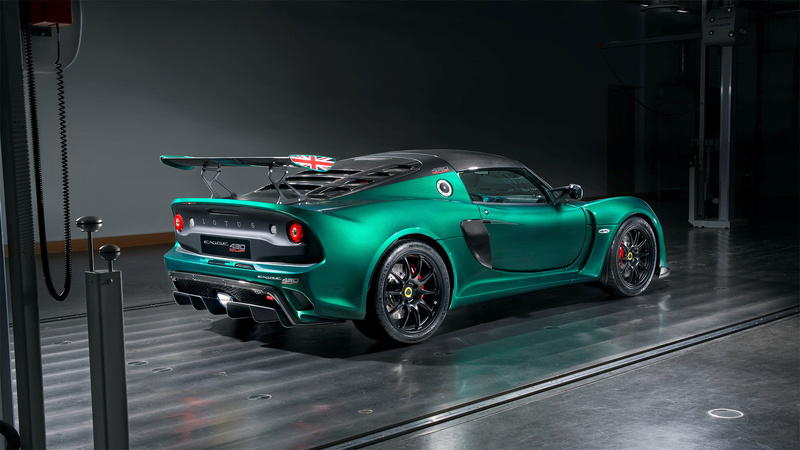 Performance options for the Exige Sport 410 include a full exhaust system in titanium, removing 10 kg from beyond the rear axle, and a number of high-gloss, visible weave carbon fibre components including instrument binnacle, sill covers, barge boards and roof. A host of motorsport-centric options are also available including electrical cut-off and fire extinguisher controls, airbag deletion, a non-airbag steering wheel, 4-point harnesses and a dealer fit FIA compliant roll cage. Gear changes are via Lotus’ open-gate manual gearshift design which provides quick and precise shifting. MSRP in the UK for the Exige Sport 410 is £85,600 including 20% value added tax.